Hurricane Florence was one of the worst hurricanes to have ever hit North Carolina. How powerful was the storm? How serious is the aftermath of this storm? What efforts are being taken to get this city back on it’s feet? Let’s take a look. At first, it looked like the storm would reach landfall as a Category 3 or 4 storm. But as the winds and rains intensified, it morphed into a Category 1 Hurricane with deadly potential. During a four day period, beginning September 13, 2018, the slow moving hurricane dropped between 23-30 inches of rain, making landfall at Wrightsville Beach. At one point the storm crawled along at 2 mph. Nine tornadoes were confirmed to have touched down in the Wilmington area according to the National Weather Service. For days later electricity, roads, and supermarkets were rendered useless. Flooding had never been worse in Wilmington. A gauge on the Black River crested at over 31 feet, surpassing Hurricane Floyd’s record. Residents who fled the area were not allowed to re-enter Wilmington due to completely flooded roads. How devastating it was for some residents to find out that there homes were flooded when they saw the homes televised on the weather channel! Many residents had damaged roofs when they came home, if not a completely flooded home. Pender County sustained an estimated $261 million to residential properties and $6 million to non-residential properties. The unprecedented flooding also caused breaching or failure at two dams. A total of 42 people died and 5,214 people needed rescuing. 138,233 registered for FEMA disaster assistance to help get them through the aftermath. Some four months later and you can still see the effects of Hurricane Florence upon the land from the floods, wind and rains. The most heart-wrenching thing to see is not the physical effects of the storm, but that, to this day, still many of the residents of Wilmington are still struggling to get back to normalcy. Many are trying to get assistance to recover what they can, either through insurance or governmental agencies. Many people are still displaced or out of work. As for the roads, Brunswick County roads have been repaired for the most part. In a majority of areas, the roads are all passable or there are appropriate detours. Repairs have started to overhaul the roads and bridges affected in the area.There was notable humanitarian efforts that helped to deliver more than 200,000 meals to those who had no means to feed themselves. Although for a time things looked bleak, there are many people who are getting assitance through FEMA and other organizations. There has been a program named STEP: Sheltering and Temporary Essential Power that has been enacted to help people return to their homes and to make the home safe and sanitary again. Some are applying for mitigation programs that buy out peoples homes affected by the storm or to fix the homes to better face future storms. Storms like Hurricane Florence are another reminder of the fragility of life and the power of the forces of nature. Check out our next blog on Wilmington, North Carolina – At a Glance (Pending). 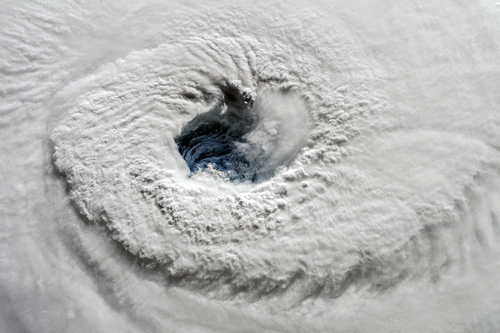 Hurricane Florence eye as viewed from the International Space Station. Elements of this image furnished by NASA.